My rating for this as a movie is 4.5 out of 10. It's a mediocre White People Dealing With Evil Relic movie that hits pretty much all of the notes you'd expect in pretty much the order you'd expect. Not much of it is laughable or anything (except for maybe the recurring use of what seem to be signs computer printed on 8.5"x11" paper in the 1960's). So there's not much to hate. And the actors, music, and camerawork are all between entirely competent and pretty good. HOWEVER, this movie was basically constructed as a machine to deliver jump scares and holy gods are these jump scares scary. Like, scary as is in Clamber Backwards Over Your Seat Blurting Out OHSHITOHSHITOHSHIT Scary. The jump scares I give an 8.5 out of 10. So depending on how you personally choose your horror movies, this may be something you should skip entirely or it could be one you want to make sure you see in a theater. Glad I saw this one in the theater because this is my kind of movie. I loved The Conjuring, and this was a fantastic prequel. The real life Annabelle doll that demonologists Lorraine and Ed Warren obtained was actually a Raggedy Ann doll. Freaky. I liked this one. It's not reinventing the wheel, and I thought the "resolution" was a bit out of nowhere and didn't make a ton of sense. But I thought it pulled off the old formula well and it was scary enough. 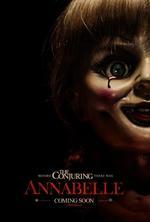 The reviews are correct that it is not as good as the Conjuring, but it did it's job. My biggest beef is one that I think a lot of horror movies suffer from these days: they showed too much of the "monster". Insidious did the same thing. I know that you probably have to throw a bunch of money at CG to get anything at all, and you're going to want to justify it, but 99 times out of 100 it is going to be scarier if you get just a glimpse in the darkness. That scene in the storage room? Holy shitpants scary. Then they went ahead and revealed too much. and yeah the neighbours' house scene, yowza. The doll itself was surprisingly not scary; the hardest part of that was believing someone would buy/keep that crazy ugly thing especially as it got more and more beat up and damaged. Could have been Letraset or stencils, that totally did not stick out to me at all. I will have to pay more attention next time (when it's on video). The most horrifying thing about this movie for me was the fact that the lead actress was operating her sewing machine while watching TV. This is a no-no. A sewing machine requires its operator's full attention. If you try to watch TV while machine sewing, not only will your sewing look like crap because your seams won't be straight and even, but it's an excellent way to wind up getting the machine's needle through your hand. I was a little mollified by the fact that in the movie the character did sustain a slight injury through her inattention.